King of the Jungle, also known as the Chak Gerent, is the meta event inside Tangled Depths that can be accessed via the Heart of Thorns expansion. The fight is similar to Triple Trouble in that you need to split the map zerg into 4 different groups, each fighting their own boss that has the similar mechanics as the other. The difference between each lane is, like Triple Trouble, the mechanic you must complete in order to proc a phase in which you can attack and kill the boss. 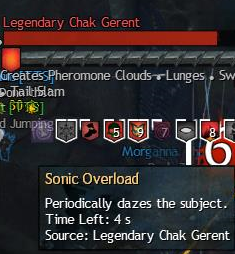 There are 4 lanes with 4 different mechanics and 4 Chak Gerent's that must be killed in the allotted time. There are a total of 3 "mechanic" phases that last 2 minutes each per Lane. After each mechanic, assuming the phase was successful, will proc a 3 minute fight phase with the Gerent. This boss was introduced when the Heart of Thorns expansion was released, and has been tweaked to be much easier than when previously launched. The 4 lanes are: Ogre Lane, Nuhoch Lane, Rata Novus Lane, and SCAR Lane. Each lane has it's own unique mechanic, but the Gerents are all essentially the same (besides tweaks from scaling). Each lane should have roughly 18-20 people to prevent scaling issues or other lanes lacking numbers (as each IP can hold roughly 80 people onto Tangled Depths). Each lane should have it's own commander for squad purposes and to show everyone on the map that there are numbers at each lane. During each lane's mechanic, you must fill the bar at least once (Level 0) to proc a fight with the Gerent. Failure to do so involves in failure of the entire meta event. You can continuously fill the bar multiple times (as signaled by "levels") to make the fight phase easier depending on each lane. Assuming you have proc'd enough levels, it is worth trying to get to the Gerent by the time the clock hits zero in the mechanic phase. There isn't a need to increase the lane's level by more than 5, as each weakness caps at 5. Also, be cautious that each mechanic phase has a Chak Rush, where Chak will spawn and blindly rush to the cannon to try to destroy it. Ogre Lane has an easy mechanic, but the Gerent appears to have more health than any other lane, making it no easy task. The mechanic involves destroying Chak Eggs (such as pictured to the right) continuously to fill the bar. You may need to be cautious of some of the Chak that spawn throughout the mechanic, as some of these are Chak Bracers that can only be killed by breaking their break bar with Crowd Control skills. Leaving some alive can have them put their protective shield on the Gerent, causing the event to ultimately fail because all your attacks will deal no damage to the Gerent if a Bracer is protecting it. 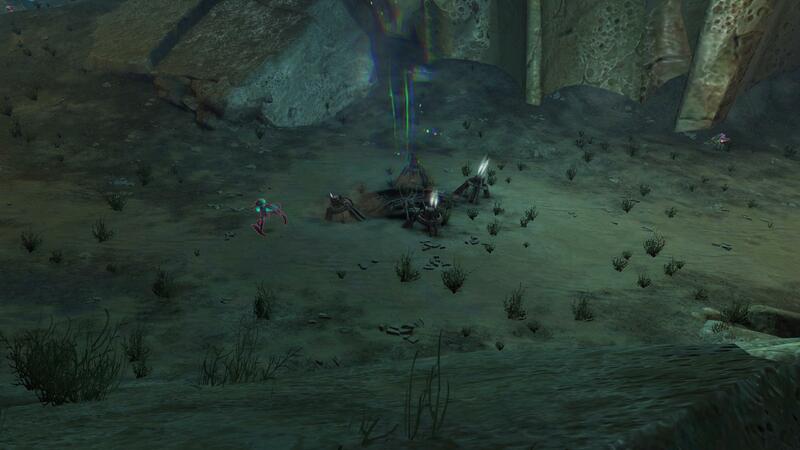 There are Ogre Egg Smashers that spawn at each lane, but heavy DPS will be much more useful, especially AoEs. Your best bet is to have everyone spread out evenly so all eggs can be covered. The more you fill the bar during the mechanic the more stacks of "Angry and Vulnerable" appear. This maxes at 5 stacks. Each stack appears to be normal stacks of vulnerability that stacks with regular vulnerability. Nuhoch Lane has the most difficult mechanic, and is often the reason this event fails. You will notice at Nuhoch there are a bunch of giant mushrooms above you. 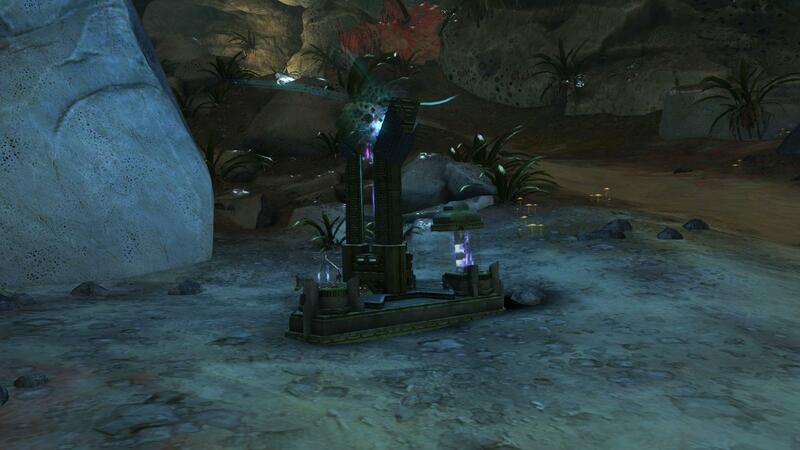 You need to separate the zerg so there are roughly 1-2 people on top of each purple mushroom. 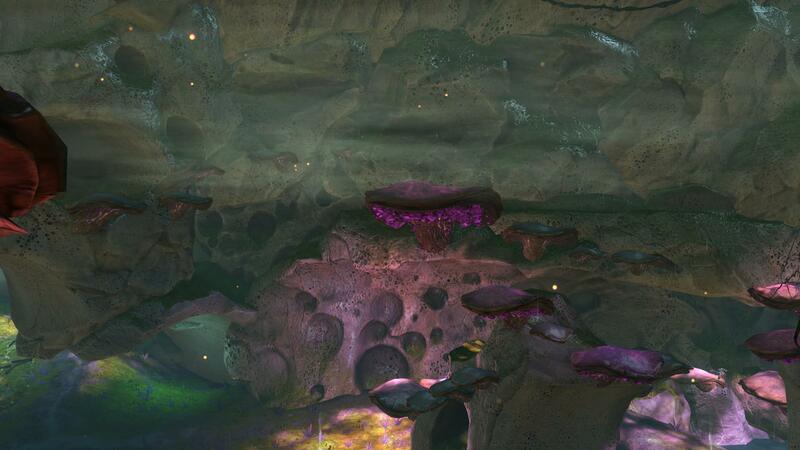 During the mechanic phase, the purple mushrooms will spawn nodules. You need to run up to each nodule and stomp them (by pressing F). Stomping them however will occasionally spawn sporlings, ranking from normal mobs to elites (depending on scale). Sporlings have knockbacks and pulls that can knock you off your mushroom. The stun from the knockback lasts longer than your ability to deploy your glider, likely resulting in your death. Stabilities and stun breaks work wonders in this lane, but proper positioning can also help prevent you from being knocked off the mushroom. After stomping the nodules, you will want to see if any other set of nodules are not being stomped, or slay the sporlings on your mushroom. It is good to move if needed but you do not want to completely abandon your mushroom as more nodules will spawn eventually. Continue stomping until you have reached at least level 0 to proc your burn phase. Increasing the level during Nuhoch spawns more friendly chak that will attack the Gerent, giving them opportunities to apply more "goop" onto the Gerent, which will eventually proc the "Covered in Goop" debuff on the Gerent, making him take a lot more damage. It is also worth noting that at this lane specifically you want to make sure you are positioning yourself correctly during the Gerent fight. Since it's harder to fill the mechanic bar at this lane, you want to have the chak charge in your advantage by positioning yourself between him and the cannon. Being on the wrong side of the Gerent can cause him to charge or move towards you, making it so he is further away from the next set of nodules during the next mechanic phase, which results in risk of failure if people do not head back early before the mechanic phase begins. The friendly Chak will add stacks of "Goop" on the Gerent, making their attacks deal more damage and slows the Gerent's movement. At 10 stacks, the goop debuffs are removed and change to a debuff called "Covered in Goop", which immobilizes the Gerent and he will take 150% damage. Rata Novus Lane is likely the easiest lane. Your job is to destroy Ley Energy collectors (pictured to the right). Destroying them will cause Ley Energy to shoot out and land randomly in the area. You need to pick up the Ley Energy and use the 1 skill to throw them into the AoE circle around the golem laying on the ground to fill the bar. Chak will try to kill you, but with enough numbers they hardly are a problem. Just be sure to focus on throwing the Ley Energy into the Golem to fill the bar. NOTE: There is never a need to break the breakbar at Rata Novus. The AoE circles (falling rocks) never actually do any damage. The Chak is stationary. His tail can still hurt, but as long as you avoid that, you can camp in the AoE circles and it will not hurt you. The only time you should break the bar is after about 25 seconds of entering this phase, because at about 30 seconds the Gerent will break the bar on his own and you will not get the extra 5 seconds of increased damage when he is stunned. Increasing the level of this lane grants more "Auxiliary Power Charge" buff. At 5 stacks, the Golem adds more firepower. SCAR lane just involves killing Chak over and over again, but the Gerent is much different in that it often gets interrupted, causing him to move all over the place. The Mechanic involves protecting the Charr around the Sonic Generator from the Chak. 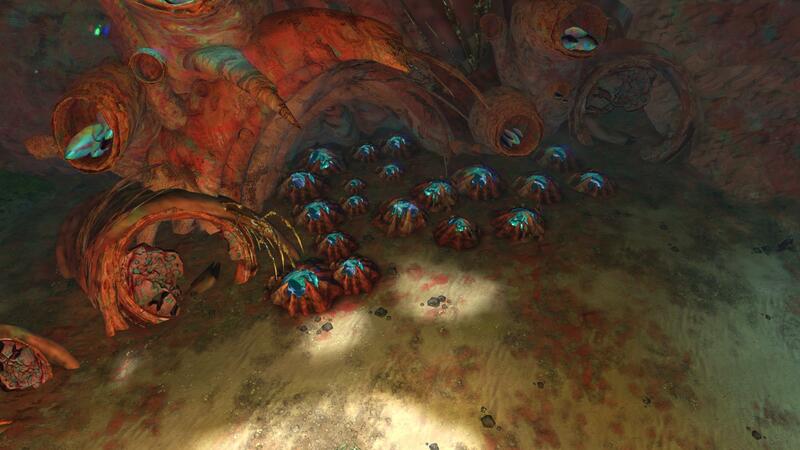 Spread out evenly in all directions to defend the Charr and making sure they do not go down. Keeping them up 100% of the time gives you automatically level 4. The sonic generator will stun the Gerent. However, when it stuns the Gerent, it simply stops the Gerent from continuing his action, rather than add the traditional stuns. He will interrupt the breakbar phase, but not actually break his bar. He can interrupt his swipes and charges as well. Be cautious when fighting this Gerent because since he does get his breakbar interrupted, he generally drops the most Purple Rings. Positioning is very important at SCAR as well, since he does charge the most. During the final phase, the Chak Gerent can charge into the cannon, potentially destroying it if positioning is poor. Increasing the level at the SCAR lane will cause the megathumper to interrupt the Chak Gerent more periodically. It may actually be more beneficial to not increase the level, but this often requires coordination as most people tend to mindlessly kill all the Chak, and the bar will increase on it's own if the Chak are continuously killed and the Charr remain alive. Just be aware during the fight that he may start an animation but stop before actually finishing his attack. He will permanently have a debuff on him during the fight called "Sonic Overload". This debuff has a countdown timer on it. When the countdown finishes, it will daze the gerent and completely stop it's animation for a few seconds. The buff is automatically re-applied when it is removed with a new timer. Increasing the level of this lane decreases the countdown on "Sonic Overload". A Chak rush will spawn during each mechanic phase. During the first mechanic phase, a group of Chak will rush to the cannon. This is a separate event, but will ignore everything and rush to the cannon. They generally suicide on the cannon, dealing some damage to it. Failing a Chak Rush can also lower the overall meta reward, so these need to be dealt with. They rush right through the middle of the lane, so they generally can be killed while doing the mechanic. The only exception is Nuhoch, since most players will be stomping Nodules. So a group generally will need to focus on dealing with the rush. You will be notified when a Chak rush starts. Chak Rushes start at the same time for all 4 lanes. The spawn time for each mechanic phase is 0:57 remaining in the first mechanic, 1:27 remaining for the second mechanic, and 1:57 remaining during the final mechanic. The Chak Gerent has five different attacks that he does throughout the event. All of them are described in detail below along with gifs. The Gerent will swipe with his claws. Getting hit by this attack deals moderate damage and will knock you back, interrupting your action. Survivable at full health. 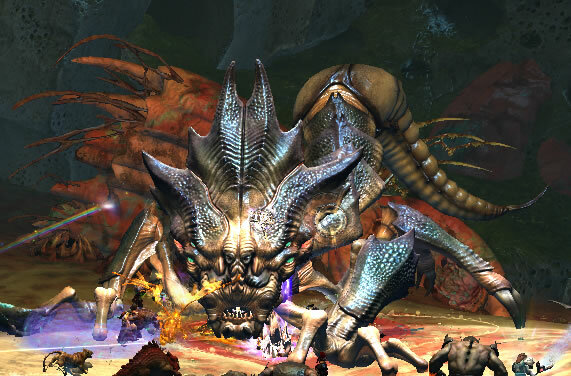 The Gerent will pick a target much like the Triple Trouble wurms during phase 2 and charge at them. Like Triple Trouble, getting hit by this attack will likely down you and will knock you backwards. Be careful, the attack is not linked to his actual hit box. This is a projectile attack and his body just tries to follow it. If the charge gets obstructed, you may still be hit by this attack despite not being hit by the Gerent's body. As mentioned, this attack will likely down you if struck by it, and can hit you multiple times in one charge. The Chak Gerent simply evades by moving to the left or right in a quarter circle motion. All attacks receive the "evaded" notification and deal no damage, as if a player was evading. This animation is very similar to Karka in Southsun Cove when they evade attacks. The Chak Gerent will continuously stomp the ground with his tail, causing tons of AoE circles to appear. Both these AoEs (except at Rata Novus) and the tail can deal a lot of damage if you get hit and will knock you down for 3-5 seconds, making them very dangerous to be hit by. In Full zerker gear, this can likely down you in 1 hit. However, that may be more beneficial than if you do not have a stunbreaker, as you will likely be stun locked too long to survive the rockfalls in any gear. As long as your teammates can res you swiftly, it may be easier to accept the downstate and be revived. It is also best to NOT break the breakbar instantly. The Chak Gerent is stationary during this phase, meaning he camps inside any AoEs, so high damage attacks like Meteor Shower or Wells do a lot more damage than if the Chak Gerent was charging and evading around. However, after 25-30 seconds, the Gerent will break out of this phase on his own. At roughly 20-25 seconds into the breakbar phase, it is best to break his bar and stun him, enabling a bit more damage and 5 seconds extra of a stunned Gerent without the rockfall. Note that Pheromone clouds also do not spawn during this phase (but may spawn at the same time that he enters the phase). Having an increased break bar phase will also prevent too many Pheromone clouds from spawning, which are very dangerous. These spawn randomly, and the Gerent has no animation to signal a spawn. Be very cautious of these, as being inside of them will cause you to lose a lot of health very fast. They grow 3x in size before fading away. Call these out if you see them. Also be cautious that they can be placed on walls, making them hard to see, or in terrain that makes it hard to notice them on different graphics settings. 1) As with most world bosses, once you feel comfortable with the mechanics of the fight, it is best to go full DPS. The more DPS, the faster the kills are, and the easier it is to succeed. 2) Positioning, as with many boss fights, is key. You want to make sure the Chak Gerent fight phase will finish relatively close to the 2nd mechanic area. If it's too far away, especially at Nuhoch lane, you will need to run back before the fight phase finishes to ensure success at the mechanic phase. Use the charges that the Gerent does to your advantage, and try to be positioned between the cannon and the Gerent in the first and second mechanic phases (Phase 3 won't matter). 3) During the second and third mechanic phase, if you get hit by the Gerent while he's underground he will knock you back and deal massive amounts of damage to you. Sometimes your character can be knocked into his path, causing you to be hit multiple times by this and perhaps even kill you. 4) If you die at anytime, assuming you have access to Nuhoch Wallows (Nuhoch Master level 2), there are 4 waypoints, 1 per lane, you can use to easily return to the fight during the first and second fight phase and mechanic phase. Typically the Ley Line Confluence Waypoint is faster if you happen to perish during the 3rd mechanic and/or fight phase. During this fight there is absolutely no time to res fully dead people. You need to be running back. Ressing a full dead person also makes you an enabler, and just as bad as someone sitting there dead. Do not res fully dead, and do not sit there dead expecting a res. 5) The Gerent's do not need to die at the same time like Octovine or Phase 1 Triple Trouble. They just need to be killed before the third and final fight phase ends. You can kill them at anytime. 6) Like most world bosses, despite the fact the Gerent goes invulnerable, it does not remove conditions when going invulnerable. Having massive amounts of condi's can kill the Gerent during the mechanic phase. 7) Since this fight consists of moving around a lot and not stacking, it can be difficult to provide group buffs. It's still worth bringing them, but everyone should also be able to provide their own buffs if needed.